as they spend watching TV. With the consumer shift to online media consumption, many of our marketing partners wonder how online video ads measure against traditional TV ads. Do traditional and new media ads complement each other? Which format drives recall most effectively? To get answers, we partnered with Ipsos to measure the relative and combined effects of YouTube in-stream ads and TV ads on ad recall and brand metrics across six advertiser campaigns. After conducting tests of 15- and 30-second spots on YouTube pre-roll instream ads and TV ads, the results revealed that YouTube and TV ads work better together. 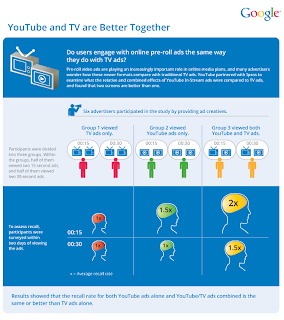 People who watched both YouTube and TV ads showed a 2X increase in brand recall than people who only saw TV ads. Those that only watched a YouTube ad had a brand recall rate 1.5X those who only watched a TV ad. This study comes on the heels of our multi-screen research, which found that brand recall jumps dramatically for consumers shown ads across all screens - TV, PC, smartphone and tablet devices. As more people consume media across multiple devices, having a multi-channel campaign strategy helps reach consumers at different points throughout the day. To learn more about our study, download the infographic and slides from Think Insights or check out our video. And, when planning your media buys, consider using a combination of YouTube ads and TV ads to help you achieve higher ad recall than TV ads alone. You can find out more information about YouTube video ads here. Each day, people watch more than 3 billion videos on YouTube - the equivalent of every American watching about 9 videos a day. U.S. online consumers now spend as much time online as they spend watching TV. With the consumer shift to online media consumption, many of our marketing partners wonder how online video ads measure against traditional TV ads. Do traditional and new media ads complement each other? Which format drives recall most effectively?